The In Tents team delights in creating one of a kind tents, banners, and other large fanciful art projects or practical shade structures for special event promoters or residential clients. 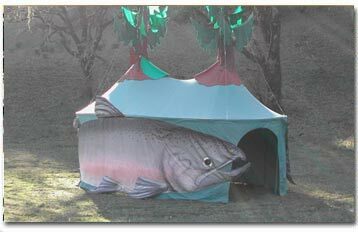 The salmon tent, a mobile educational exhibit, was a special order contracted by Friends of the Eel River. 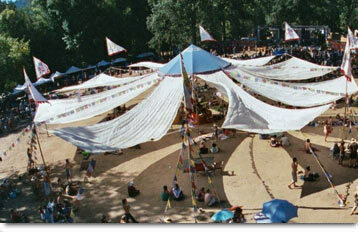 It won the IFAI tent division Award of Excellence for tent manufacturing in 2000. The appliquéd walls of the Tibetan tent have screen and roll up clear vinyl windows with chiffon curtains on the inside. The roof has a stain glass circle of color that creates an interior rainbow. 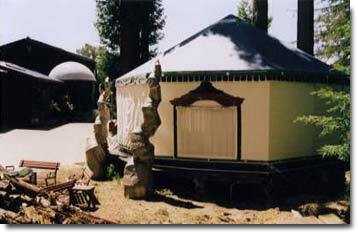 This tent, which is set permanently on a redwood deck at a private residence, won the IFAI International Achievement Award for tent manufacturing in 2001. 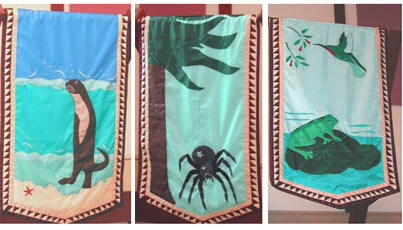 These lively banners were created for the College of the Redwoods' new early childhood education building. 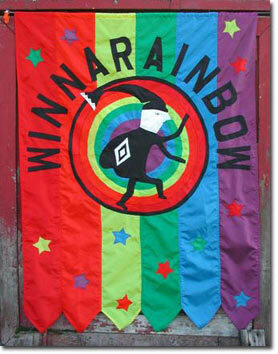 This Camp Winnarainbow banner was remade in 2003 to replace the first one which lasted 20 years! 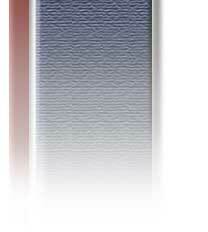 In Tents uses brightly colored and long lasting nylon cordura for our appliqued banners. Designed for Earthdance as an altar space, this structure stretched for 100 feet, and contained 1/2 mile of Tibetan prayer flags. 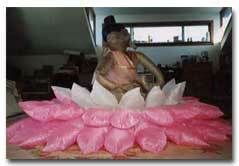 The Tibetan tent was set on 16 foot legs and a recycled parachute was cut and pulled in the eight directions. 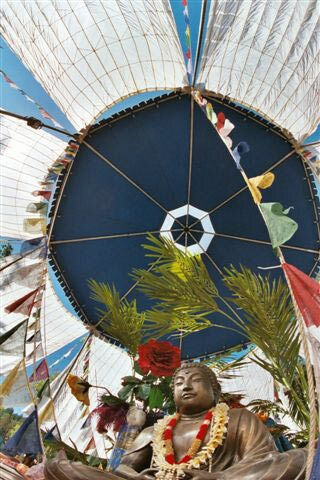 15 foot flags were flown from each corner and strings of brightly colored prayer flags traveled down each support rope. 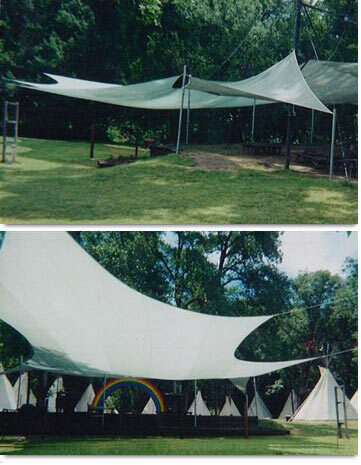 Two different views of a large free form shade, a special order by Camp Winnarainbow. The shade is designed to be easily clipped to pulley cables to raise and lower with ease at the beginning and end of each season. The tipis in the background are also made by In Tents. 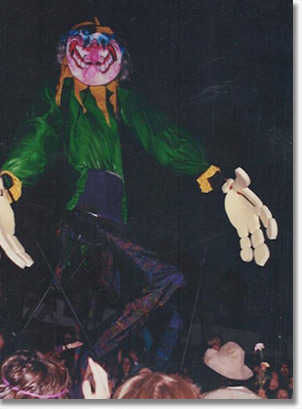 An inflatable Buddha, a Chinese New Year's Dragon, and a twenty-four foot puppet were all colaborative art projects led by In Tents created for the Grateful Dead. 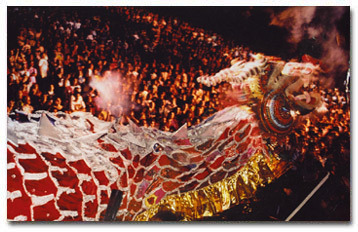 The Dragon last danced for Mickey Hart's world record drum circle, and the lotus is now used as part of the Portal to Earthdance, Northern California.